Today’s spaces around the globe is a bit of a departure from what I was originally thinking for these series, i.e. well-designed spaces for living, eating, or socializing. But really, most of us spend the majority of our time at a work place — where we eat, socialize, and basically, for better or worse, live there too. For a place that accounts for so much of our daily life, it sure would be nice if it looked kind of awesome, wouldn’t it? 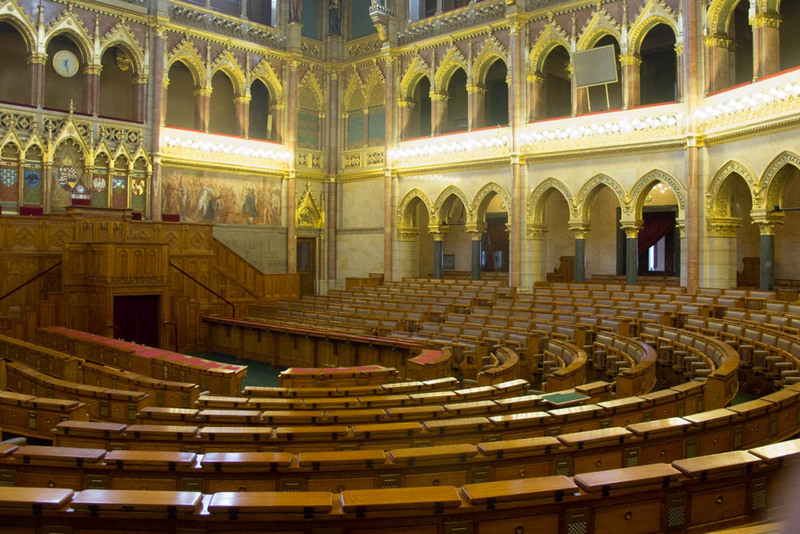 Once I realized that, there was no question in my mind that the Hungarian House of Parliament most definitely qualifies as a well-designed space around the globe. 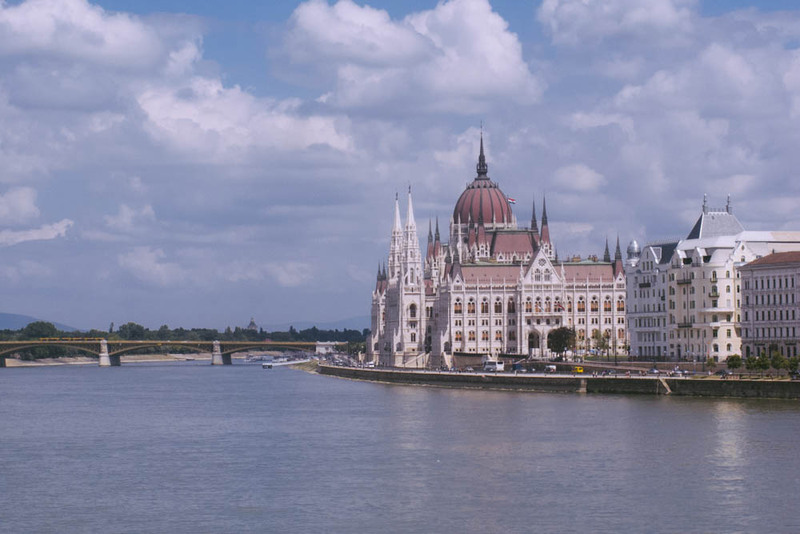 Hungarian House of Parliament on the Danube River, Budapest, Hungary. 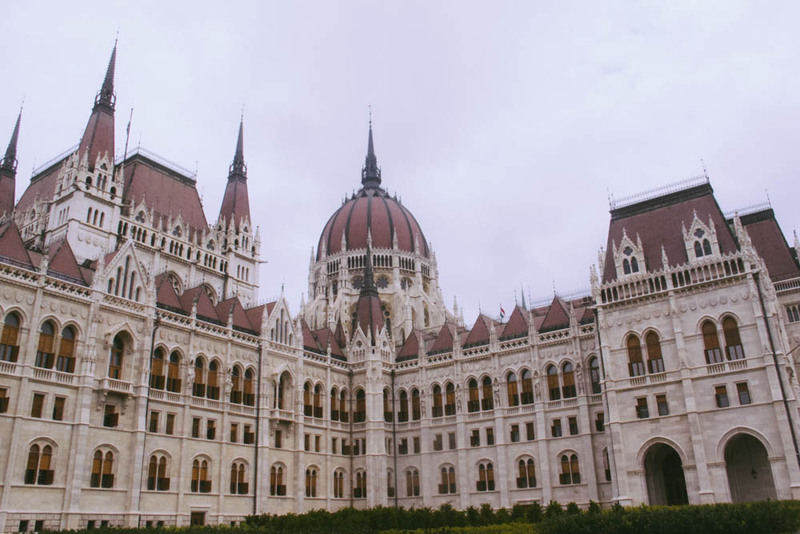 Because Hungary’s parliament – sitting on the bank of the Danube River – is not just kind of awesome, it’s ridiculously stately and ostentatiously awesome. Don’t mind if I do get to look at this every day, walk around all the glistening gold, stare at marble statues and ornate woodwork, and take in all the colors — instead I am sitting here among sterile white walls, tempered frosted glass, and if I look underfoot – ah it’s better not. But, at least I have a good window view. I digress, much better to focus on this beauty in all it’s baroque glory, and to imagine what its like to come to work there everyday. Shall we? Legislator afoot, Hungarian House of Parliament, Budapest, Hungary. 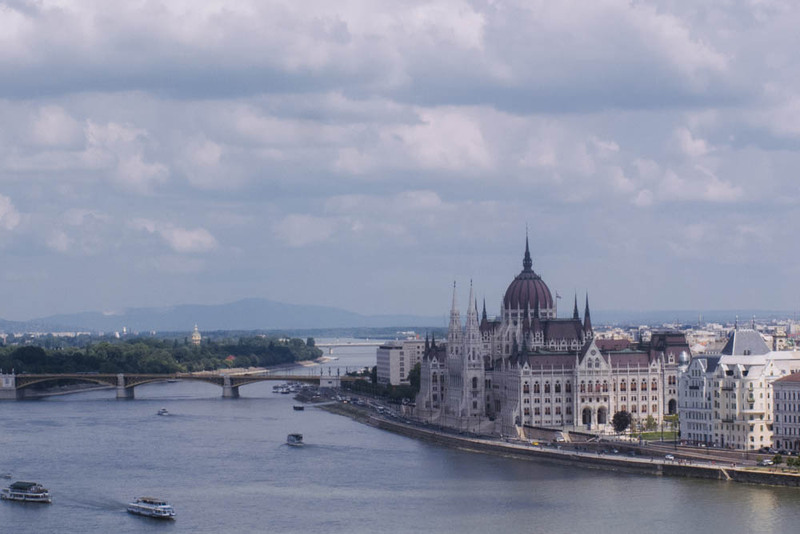 One of Europe’s oldest legislative buildings, Hungarian parliament was designed by Imre Steindl. 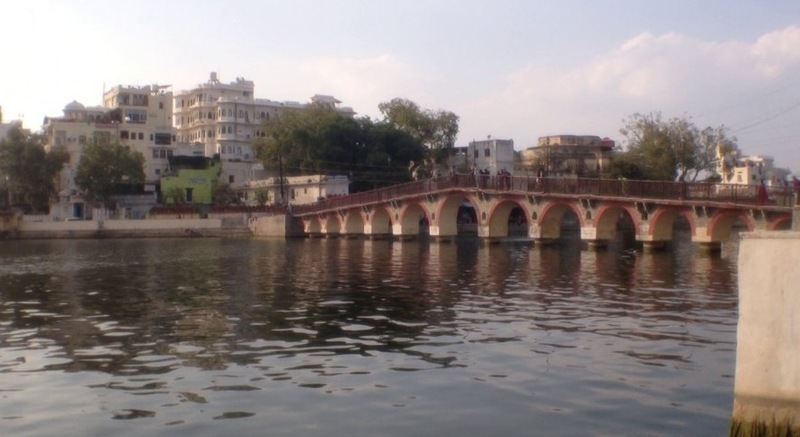 Construction began 1895, the building was inaugurated 11 years later to mark the 1000th (!) 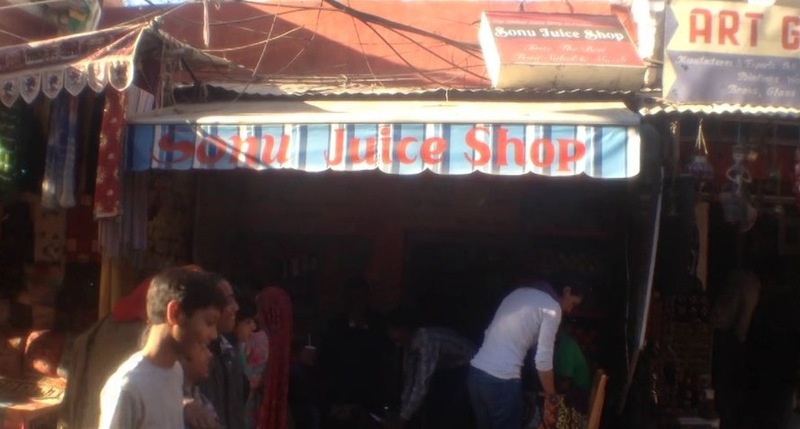 anniversary of the nation, and it finally opened for business in 1904. The building is constructed in the Gothic Revival Style, with so many arches and domes my neck was seriously hurting after the two hour tour. 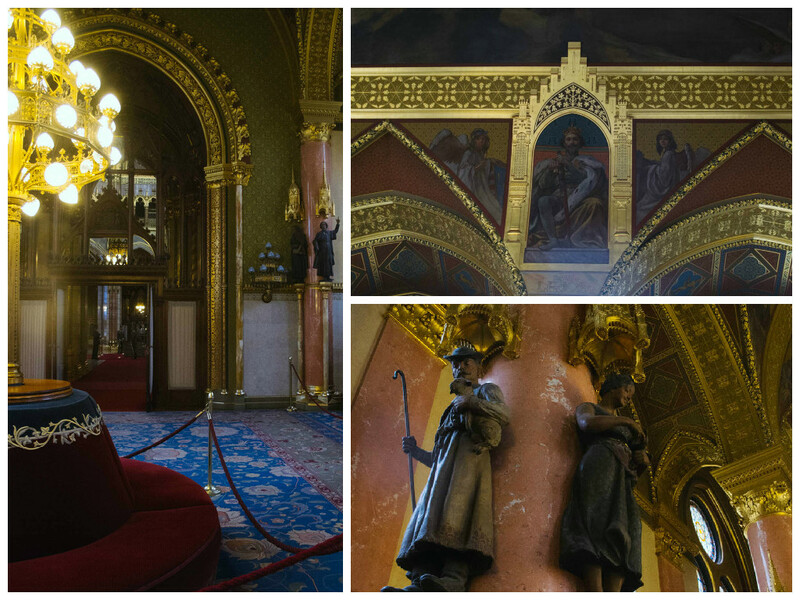 The corridors of power at the Hungarian House of Parliament, Budapest, Hungary. Not your average everyday corridor, eh? I am a particular fan of the parquet, which seems to be done in herringbone all over Europe. And the lamps — I’ll take a few of those, my hallways could use a little sparkle. Maybe skip the pink carpets (though they do look very nice here), but the stainglass windows are awesome. I am not sure how much of the rest of this I would like to replicate at home, but I sure am inspired by all of the resplendent, gilded, details. You want to hear a neat story? 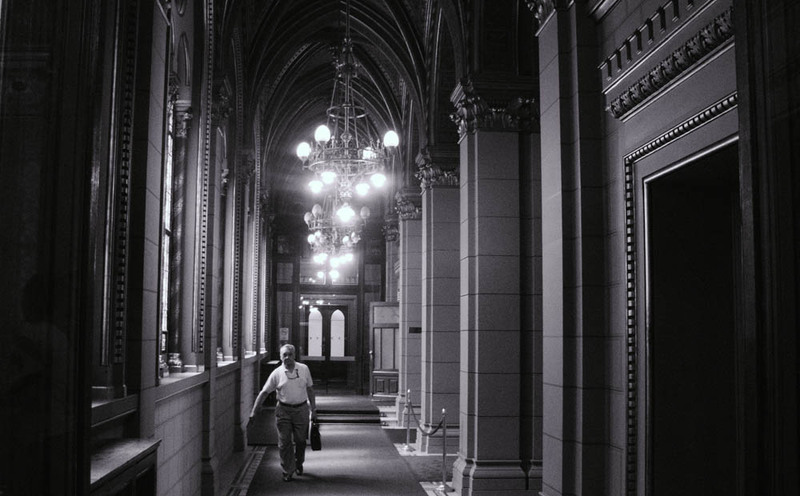 Back in the day, when cigars were all the rage and the deals were made anywhere but at the official meetings, Hungarian legislators would all hang out in the hallways of the great big building — and I mean why, not — these hallways look pretty great to me. In fact, the peoples’ representatives spent so much time out there, that brass cigar holders – with their personal seat number – were installed on the windowsills so that they could rest their precious in the proper place if they needed to run in for the vote. 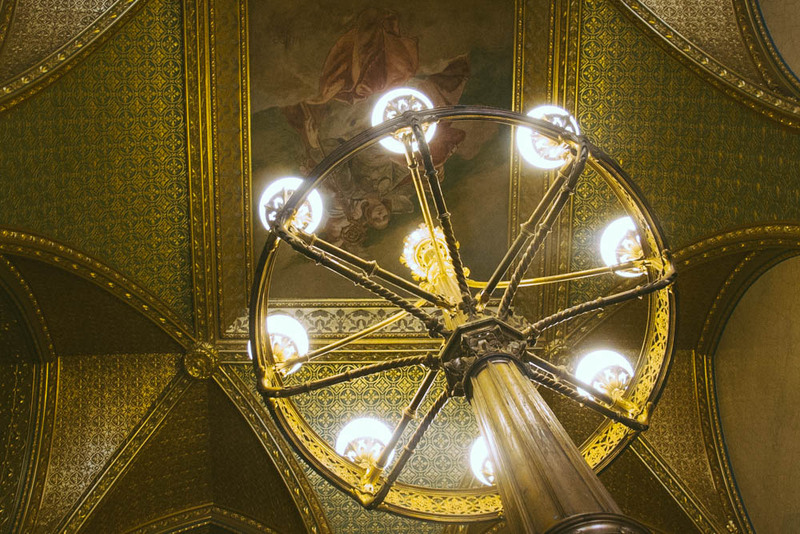 Brass cigar holders at the Hungarian House of Parliament, Budapest, Hungary. Moving on from the hallways, how about a gilded window nook? You need one of those to do all your politicking in case the hallways get too crowded…or for gossiping, thinking, or whatever else, everyone surely could use a touch or two of gold in their lives. A gilded nook! 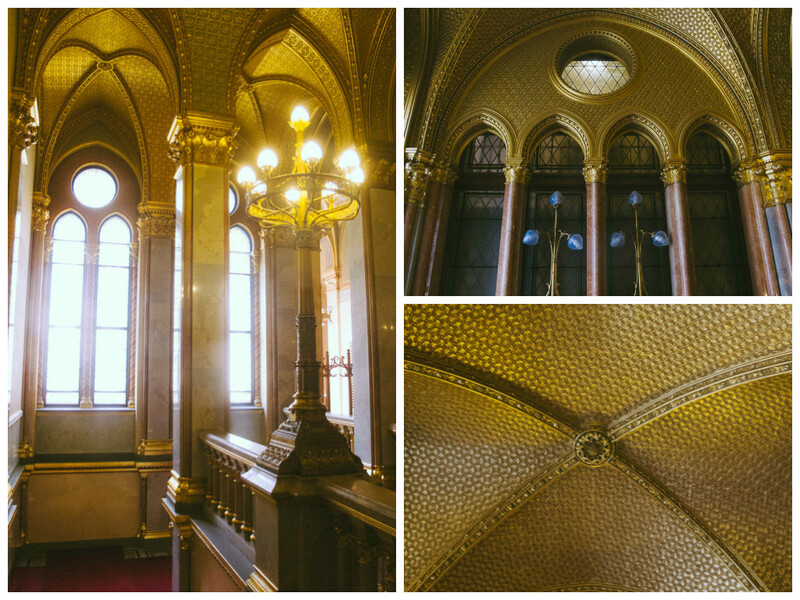 It’s all in the details at the Hungarian House of Parliament, Budapest, Hungary. And say you wanted to go have a proper hang out, with a circular couch and all. Plus you want to be inspired so you look at all the statues of the great national heroes from thousand plus years past. 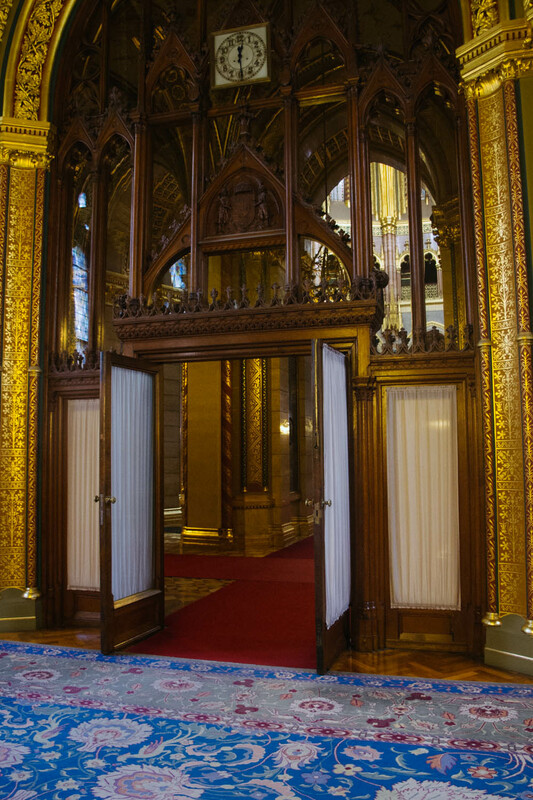 And you must be surrounded by impressive wood paneling and some gold carvings, because that would be neat. 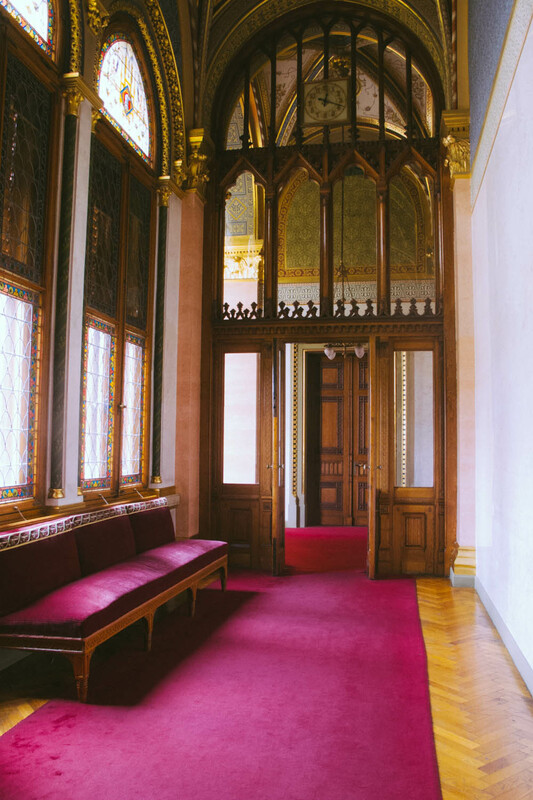 Looking around this room, there are endless possibilities for small talk — you can discuss everything from King Stephen I to the hours it took to carve a single archway over the doors. And isn’t that part of great design — giving people something to talk about? 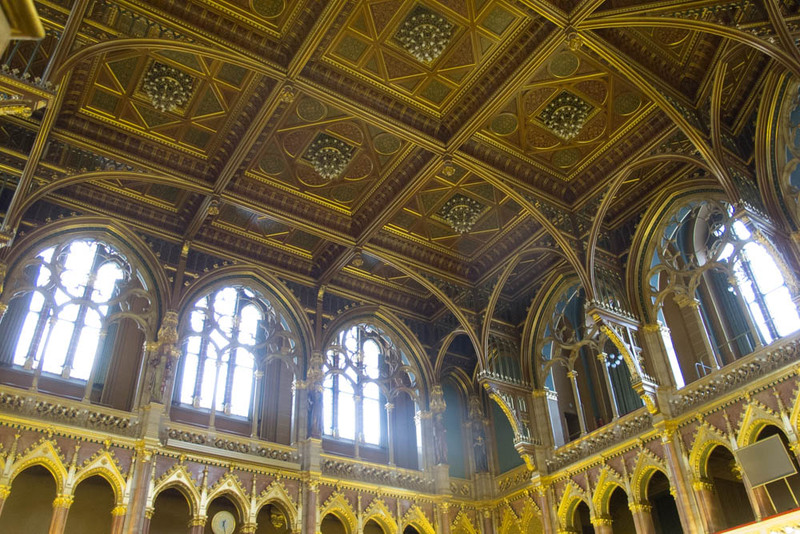 Great banquet room at the Hungarian House of Parliament, Budapest, Hungary. Speaking of great rooms — how about this main meeting chamber. I typically listen to the guide quite attentively because I am a history (and general knowledge) nerd, but here, I just couldn’t. After I picked my jaw off the floor, I just stared for a bit, and then started taking pictures like a maniac. That ceiling! those columns! so.much.gold. 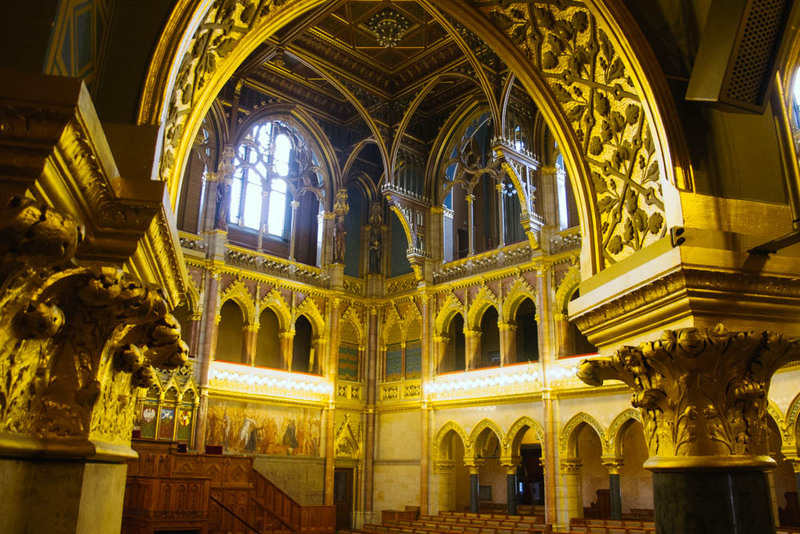 The debate chamber at the Hungarian House of Parliament, Budapest, Hungary. And there you have it — a rather visually stimulating place to work. or fall in love. or go about your life, because if you are spending so much time in a place, it’s pretty neat if it’s inspiring like this. Intrigue in the corridors of power. 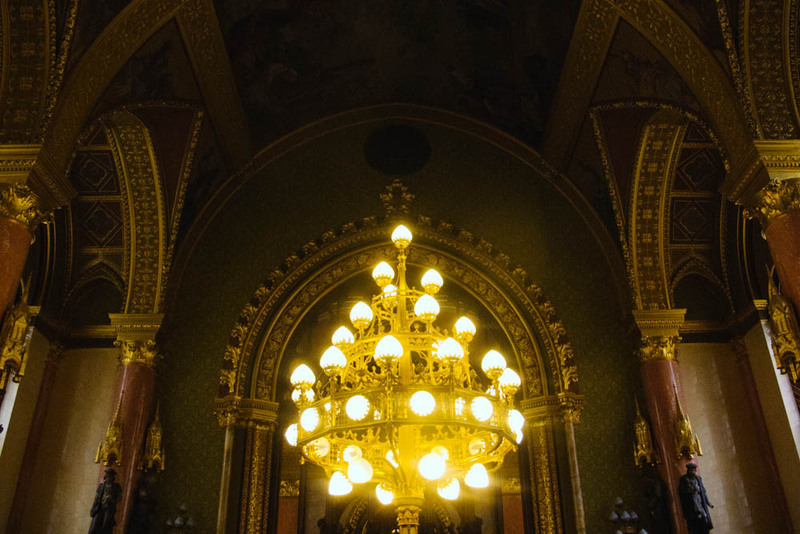 Hungarian House of Parliament, Budapest, Hungary. 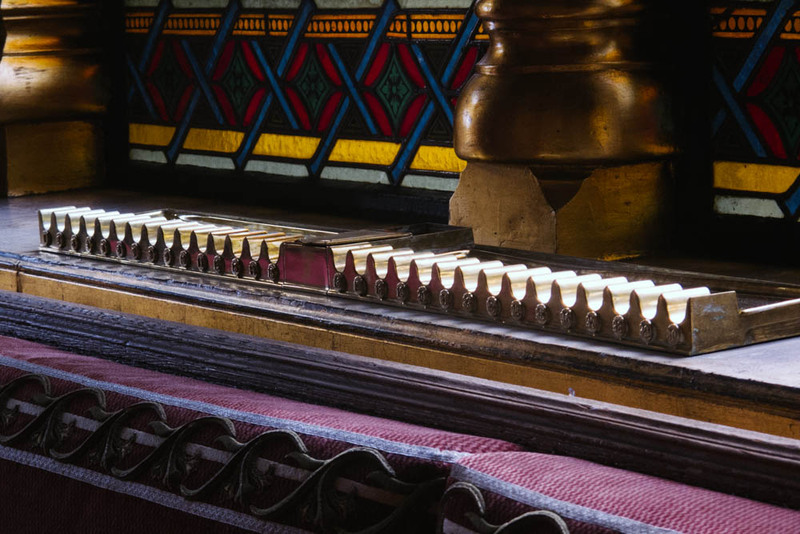 Tours are offered in a multitude of languages, with Hungarian and English-language tours being the most frequent. 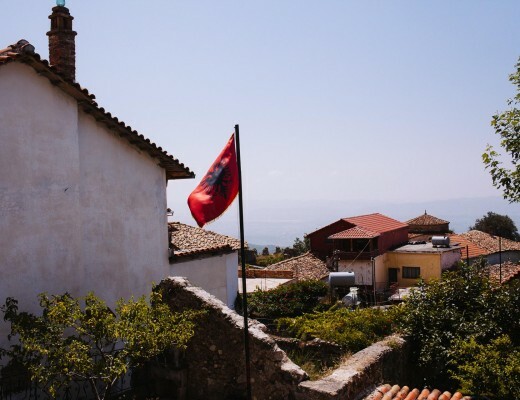 During high tourist season the tours sell out an hour or so before the departure, so if you would like a French speaking tour — plan accordingly, by consulting the parliament on this website. Come early! I had to wait 2 hours for the next available English-language tour. Which is totally fine because there is plenty to do and see around the Parliament. If you are EU citizen bring you passport! Your admission ticket price will be less than half of the hefty 5200 HUFs that everyone else pays. 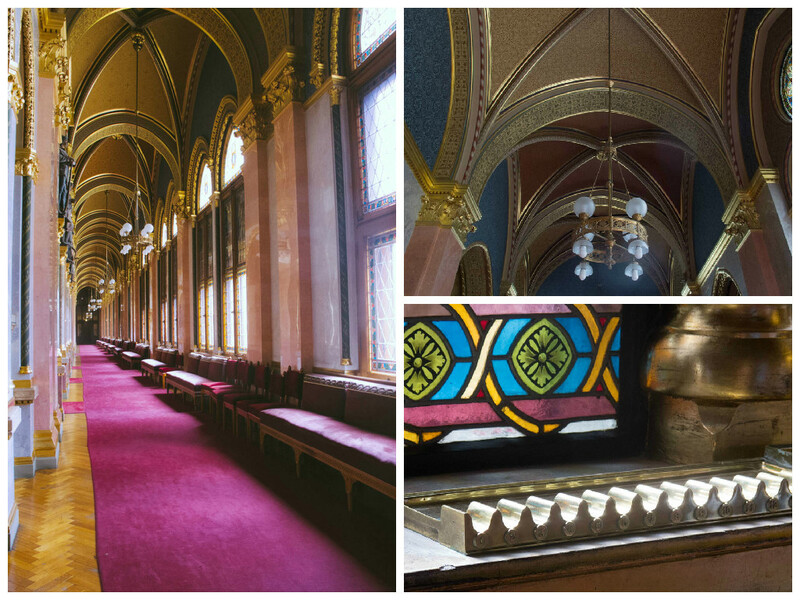 Hungarian House of Parliament. Budapest, Hungary.